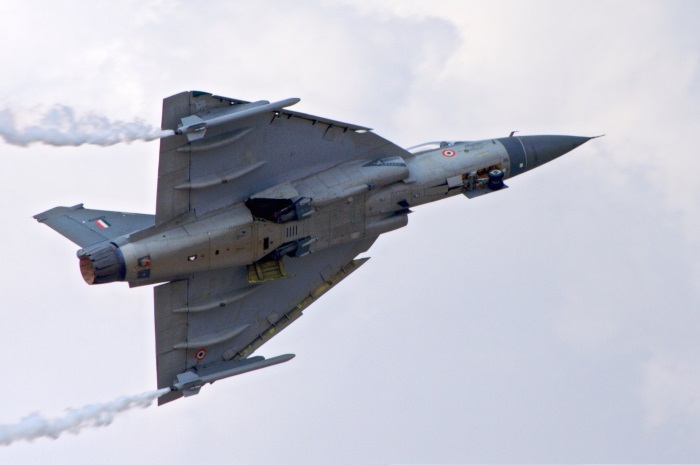 Tejas LCA is to be equipped with an EW suite developed by DRDO's Defense Avionics Research Establishment (DARE) in collaboration with Israel. The EW suite contains radar illumination, laser illumination and missile-lock warnings, a radar jammer and a flare dispenser. The suite is capable of dealing with multiple simultaneous threats from air or ground. The EW suite centerpiece is an integrated Radar Warning and Jammer Suite (RWJS) that can detect when the aircraft is being illuminated by enemy radar, determine the type of radar (ground based or airborne) and its operating mode (track-while-scan, lock-on); alert the pilot and facilitate neutralization of any radar guided surface-to-air or air-to-air missile threat through Digital Radio Frequency Memory (DRFM) based signal jamming. Digital Radio Frequency Memory (DRFM) is an electronic method for digitally capturing and coherently re-transmitting RF signal such that the transmitting radar cannot distinguish it from other returns that it receives and processes as targets. The DARE RWJS provides 360-deg coverage. Previous generation fighters, like IAF Jaguars, are equipped with just a Radar Warning Receiver (RWR), which could only alert the pilot to hostile radio frequency emissions, but not jam them. If the DARE EW Suite clears its currently underway (January 2015) trials, Tejas would become the first Indian fighter aircraft to be fitted with a Radar Warner and Jammer equipment. The DARE RWJS is similar to ELT/568(V)2 developed by Italy's Elettronica S.p.A. and EL/L-8247/8 developed by Israel's ELTA. Typically a RWJS can be integrated with any airborne platform’s avionics, including Chaff and Flares Dispenser, Missile Warning System, Laser Warning System, Towed RF Decoy and Multi-Function Display. It is flight-line re-programmable. Using PC-based equipment and user-friendly human-machine interface, threats and jamming EW techniques may be easily updated. The RF signals received via the receiving Antennas are amplified by Front-End Amplifiers and fed to the advanced Channelized Receiver in the Central Unit. The Receiver measures all the RF signals parameters such as PRF, PRI, PW, direction etc., building pulse descriptors that are fed to the Central Processor. The Central Processor extracts the threats according to priority and level of lethality and provides the situation awareness to the pilot via the Multi-Function display. Upon detection of a lethal threat, the Central Processor activates the Jammer, selecting the appropriate EW technique for each threat. The jammer is capable of responding simultaneously to several threats by implementing Power Management techniques. The suite was test flown for the first time on Tejas PV1 on January 10, 2015 at HAL airport in Bengaluru. According to a DRDO press release "the equipment was noted to be detecting Radar signals operating in and around the flight path." Over the coming few months, ADA and DARE will be scheduling further sorties to evaluate the system in various signal scenarios. An EW system developed by DARE for MiG-29 UPG reportedly was rejected by the IAF due to performance shortfalls. The suite was earlier tested on the ground using simulation. Airborne testing on PV-1 was initially expected to start in November 2013 or early December 2013. In October 2013, Deccan Herald reported that DRDO has fitted the EW suite on LCA PV-1. PV-1 had been on the ground since 2001-02, having flown 242 test flights till then. According to MoD's annual report for 2013-14, Ground Acceptance Test (GAT) has been completed. IDP Sentinel members can remain updated on the Tejas project by visiting the link below.